The GSGS start-up honours grant, which I received from 07/2014 to 12/2014, allowed me to continue my studies on the isotopic effects in evaporating water bodies. These studies focus on the distribution of H217O/ H216O and H218O/ H216O isotopologues in the liquid phase and their potential for hydrological balancing. The general idea is to establish the so-called 17O-excess (a second-order parameter which describes anomalies in the three stable oxygen isotope concentrations with respect to global average precipitation) as a proxy for relative evaporation loss of water bodies. 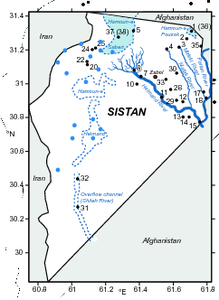 This work mainly involved the development of a numerical model for the isotopic evolution of evaporating water bodies in closed basins (by the example of the Sistan Desert, Iran (Figure 1)). The prediction of oxygen isotope distribution includes various parameters as relative humidity, water surface temperature and the isotopic compositions of initial freshwater and atmospheric vapor. The general theoretical background and equations for steady-state evaporation and isotopic exchange with atmospheric vapor are provided e.g. by Criss . Isotopic trends predicted by our model are in good agreement with measurement data from my master thesis Triple isotope systematics in natural waters from the arid environment. Reported values of average annual relative humidity in the area range from approximately 30 to 35 % and confirm the modeled isotopic evolution of evaporating waters. Depending on data availability and the number of free parameters, our evaporation model allows an estimation of average relative humidity in the region, based on isotope analysis of carefully selected water samples. Furthermore, the 17O-excess appears to be a promising tracer for the quantification of total evaporation loss with respect to the initial water body. A paper manuscript has been prepared and we intend so submit it by April 2015. We provided a large suite of waters from a field trip to the Atacama Desert (Chile) in spring 2014. These samples included natural waters from the Salar de Llamará (a groundwater-fed salt flat) as well as waters from pan evaporation experiments which we conducted in the field. The isotope analysis consists of two steps: In a first step, the water samples are fluorinated with CoF3, resulting in oxygen release, which is then trapped cryogenically. Subsequently, released O2 is analysed for abundances of 16O, 17O and 18O by isotope ratio gas mass spectrometry (Thermo Scientific MAT 253). First results indicate that natural evaporation in the Atacama Desert can be compared to observed trends in the Sistan Basin but suggest the influence of additional parameters as continuous groundwater recharge and water salinisation. In the meantime, our research proposal was accepted by the DFG and I started working on my PhD thesis. The work will focus on isotopic fractionation of oxygen in snow and ice in connection with sublimation and melting. I would like to express many thanks to the GSGS and the steering committee for funding my research and enabling me a seamless transition between my graduation and my PhD studies. Criss, R., 1999, Principles of stable isotope distribution. Oxford University Press, New York, U.S.A., 1. edition.